1.3 How to Download AP ECET 2019 Hall Tickets? The Jawaharlal Nehru Technological University Anantapur (JNTUA) Board will release Andhra Pradesh ECET Admit Card 2019 from 20th April 2019 onwards. The aspirants who will appear for AP ECET Exam should download the exam hall Ticket by the link which is provided below or from the official website. Applicants are not allowed to enter the Exam Hall without the AP ECET Admit Card 2019. Only for a Short period, the Exam hall ticket will be available to download. So, the Candidates are advised to download the AP ECET Hall Ticket as early as possible before going to attend the exam. AP ECET 2019 Hall Tickets Download 20th April 2019. The JNTUA released Notification for AP ECET Exam 2019 on 11th February. The Candidates who have completed their Diploma and B.Sc (Mathematics) can apply for this exam to enter into the regular 2nd year B.Tech & B.Pharmacy. They also called lateral entries. The Eligible Aspirants applied online before the Last date as per the official Notification. 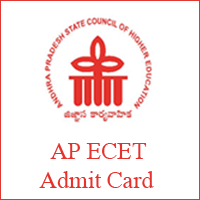 The AP ECET 2019 Admit Card download link enclosed in the following sections. The Candidates who have downloaded the AP ECET 2019 Admit card should also check the Exam Pattern and AP ECET Syllabus for better preparation. The AP ECET exam will conduct for the students who are seeking admissions into different streams like Engineering, Pharmacy, and B.Sc (Mathematics) stream. The AP ECET Exam Pattern and syllabus are different for all these three streams. The candidates who completed the application process are waiting to download the AP ECET Admit Card. For those Aspirants, we have provided a direct link to download the AP ECET Hall Tickets 2019. It is a very small process because by clicking once on the link you can directly download the AP Engineering Entrance Common Test Admit Card. After the Completion of downloading the AP ECET 2019 Hall ticket, the Candidates have to read the instructions mentioned on it. The Applicants should also carry any of the Identity proof like Adhaar Card, Pan Card, voter id, etc. while going to attend the AP ECET exam. The AP ECET 2019 Admit Card download link will be available on the Official site 15 days before the test date. Go to the “Instructions to the candidates” which is at the bottom of the homepage. Search for the related link of AP ECET Exam Admit Card. Then click on the link related to AP ECET 2019 Hall Ticket Download. And now enter the details like roll number and password. Your AP ECET Admit Card will be displayed on the screen. Finally, download the file and take a print out of it for future reference. Above downloading process is kills the students valuable time. To save your valuable time, we have provided the direct downloading AP Engineering CET 2019 Admit Card link. This link will redirect you to direct homepage where you can enter your APECET Registration Details. So, willing candidates just click on the below link and enter your ECET Registration Number 2019, Password, Date of Birth details. Then your Andhra Pradesh ECET Hall Ticket will be displayed on the screen. Firstly, check your details which are displayed on the screen whether correct or not. Then click on the download option. Finally, make the possible hard copies of AP ECET Hall Tickets 2019 for further use. Candidates can refer to the official website of APSCHE that is sche.ap.gov.in/ECET if you have any other doubts. Candidates must click on the below link for instant APECET Admit Card 2019 download.